Mark Thompson reports on the 102 Labour MPs who signed up to be high profile supporters of the No2AV campaign - yet used AV in the Labour leadership elections. One hudred and two Labour MPs have signed up to be high profile supporters of the No2AV campaign. They have made it clear that they do not want us to have the right to list candidates in order of preference for Westminster elections. The No2AV campaign has just launched its latest phase entitled “Keep One Person One Vote“. They are arguing that AV allows some voters to cast more than one vote. This argument seems utterly unconvincing to those of us who argue AV just gives one vote to each person but that vote is transferable. It means all electors have the chance to have their say about who is ultimately elected by being able to express a preference about who is chosen from candidates in later rounds even if their initial first (or second etc.) choice is eliminated. But what seems odd about the 102 Labour MPs who are supporting No2AV is that AV is used for Labour leadership elections. And if the argument that AV gives some voters “more than one vote” (and hence is in some way undemocratic) is to hold any water then surely that would equally apply in leadership elections as it would to Westminster elections? So you might expect that those Labour MPs when it came to the leadership election last year would stick to their principles and only cast one vote. Otherwise by their own terms they would be getting unfair “extra votes”. • And 41 of those No2AV Labour MPs marked all 5 preferences. In total 80 out of the 102 marked more than one preference taking advantage of the fact that AV allowed their votes to be transferred. Some will doubtless argue that voting for the leader of a party is different to voting for an MP. But the way the No2AV campaign has been pushing this “Keep One Person One Vote” argument has been from the standpoint of it being a fundamental democratic principle and that AV breaks it. That would apply no matter who or what is being elected. The 80 Labour MPs who have signed up to this campaign whilst only very recently taking advantage of the extra breadth of democratic choice AV offers would do well to reflect on why they are happy to deny the rest of us that same choice for Westminster elections. Because electing an individual is a different exercise from electing an assembly, and choosing from a range of candidates within a movement is different again from choosing between official established parties. Quite apart from that, the argument is of the form “If you think taxes should be higher, why don’t you pay more voluntarily”. I don’t think anybody who opposes AV is saying that they will refuse on principle to use it if it passes. Anyhow, it does give some people more expressive preferences than others. My first choice was Ed Miliband, but I used one of my votes for Diane first because I knew that voting Ed would get me one vote, whereas voting Diane would get me an expressive vote to explain where my choice was coming from politically – even though she wasn’t the candidate I most wanted to win – and an effective vote on top of that. People who vote for losers do, under AV, get their preferences counted more fully than people who vote for winners. It’s at heart a veto system, so that’s inevitable. Of course they are different situations but what is the justification for MPs having “multiple votes” (No2AV’s own terminology) in a leadership election and not for Westminster elections. As far as I can see it is being expressed as a point of principle so it should apply in all situations. I did think about this too but why is there not a deafening clamour from these No2AV MPs (who make up nearly half of the PLP) to change the Labour leadership electoral system to FPTP? I have not noticed a squeak about this. Instead they apparently quite happily and effectively use AV. And to be clear, I am aware there has been some talk of changing the third/third/third split between MPs, Unions and members and to make sure people do not get more than one ballot paper but nothing about FPTP. Well that’s your choice. But at least you were able to express this view. FPTP would not have allowed you, or anyone else who may actually have wanted Diane to win to vote for her without forfeiting the right to have an effective say between the final two. No. All candidates have all transferable preferences for them recorded in every round. If you order the steak in a restaurant and it’s off and you have the fish instead you have still only had one meal. But also don’t forget that Labour MPs voting through preferential voting for a range of other contests – backing it for select committees in the Commons and for Mayor elections around England for example. If preferential voting breaks such an important principle as ‘one person, one vote’ it rather raises the question why they didn’t apply that principle on any of those other occasions. Just a quick observation that whilst the Labour Party do use AV to elect their leaders the MPs are one of those classes of members that can actually have multiple votes (1 for being an MP, 1 for being a Union member and a third for being a member of a ‘qualifying’ organisation). I am ever so bored of this analogy. Nobody is saying that some voters under AV get more than one MP! Apart from anything else, it would be STV. I have had one meal, but two opportunities to choose. I could go into a tortuous analogy with multiple food options about how this means people who want things which are often off the menu get more of a say in what the restaurant orders when stocks run low, but I think it would bore everyone. I imagine some Labour MPs do support a move to FPTP for leadership elections, I think on balance AV is a less bad system in that sort of scenario, but could the reason none of them are saying it have less to do with issues of the principles, and more to do witht the fact that it would be reported as “80 Labour MPs say Ed Miliband was not legitimately elected Leader”? And Constituency Labour Parties use AV to select their Prospective Parliamentary Candidates! The problem for me is that I just would not want to express any other preference than a vote for my most preferred candidate. If he or she is unlikely to get 50+ then I would not want my vote to be transferred to the least disliked of the other candisdates and then feel that I had helped to get even the least disliked candidate elected. Just think, my preferences would be Labour first and Tory and Lib Dm nowhere. I could not give a second preference to either of the other two main parties. 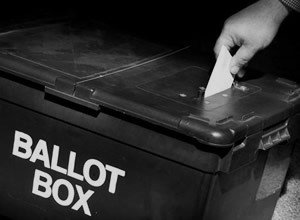 For me FPTP is a better way of sorting out the candidates than allowing candidates to win on the basis of transferred votes from electors who would have preferred one of the losing candidates. It probably could result in the Party in the middle getting more seats than they deserve, leading to more coalitions and a perpetuation of the sort of Government that we have to put up with at the moment. I would not have minded voting for a PR system based on single member constituencis plus Regional multi seat regional constituencies which would have the virtues of AV but , for me,none of the disadvantages. AV is a poor alternative. I hope the Referendum rejects it in May.